I doubled this and my hubby and I each took a batch to work, everyone loved them. 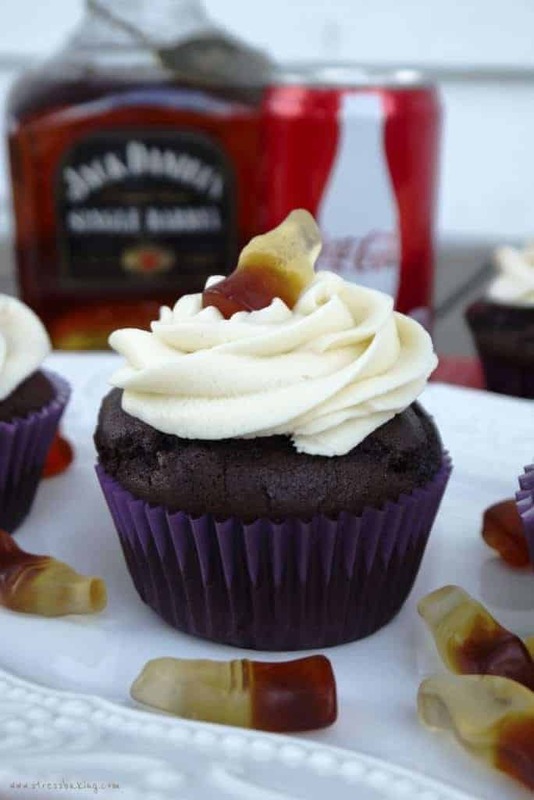 The cakes are so moist and soft, and the sugar really tones down the Jack Daniels, it is a great cupcake! Thank you! What changes would you suggest as far as using recipe to do a layered cake instead of cupcakes? I’m thinking of still layering ganache between but not sure about measurements for the cake itself? I’d recommend doing a 9″ round 2 layer cake – but I wouldn’t make any changes to the cake mix. You’ll probably need to increase the amount of ganache filling (depending on how much you want in there) and spread it in between the two cake layers. Not sure how well it would turn out, but if you do it please let me know how it turns out! The top of the recipe mentions it yields 24 but the recipe itself says 12? You’re absolutely right – thank you for pointing that out! I changed recipe plugins and didn’t notice the discrepancy. I just changed it 🙂 Thank you again! Thanks for the note – I’ve updated the recipe to reflect the change of 24 candies! I AM MAKING THESE FOR MY BROTHERS WEDDING! Are they safe for kids?? I can’t recommend allowing children to eat these due to the alcohol, however small the amount may be per serving. Maybe make a batch without the whiskey just for them! So first off i would like to say Awesome recipe! Loved Making these. The recipe was easy to follow and a joy to make. Those are gorgeous! I’m sure your guests will absolutely love them 🙂 Thank you for sharing! I am making these for my husbands 30th birthday. Is it possible to fill the cupcakes with the ganache and keep them in a Tupperware overnight and then frost them in the morning? What would you suggest? I’m trying these for my boyfriends 29th bday which is Friday. But I work everyday I’m trying to get them done tomorrow since I have a day off. How should I go about making them so they’d be fresh for Friday evening? Or maybe just leave the actually cupcake making till Friday morning before work? Any suggestions? Thank you so much! Hm…I’d recommend waiting until Friday for the best results. You could also make the frosting, ganache and batter ahead of time and keep it in the fridge until you’re ready to bake, but I’m not sure what that might do to the effectiveness of the Coke and/or baking soda. Let me know how it works out for you! You could increase the amount in the frosting and the ganache by a little bit – but if you add *too* much, it’ll get overwhelming. Good luck! Hi There! I wanted to know if i could use a photo from this series for a piece I am doing for BridalGuide.com. Please get back to me ASAP. Thank you! I made mini cupcakes and they came out wonderful!!! Thanks for the recipe! I’m so glad that you liked them! Hi! You think Black Label will work instead of JD? How would you adjust the recipe for mini cupcakes? I’ve never tried to make them in mini form before since they wouldn’t be big enough for the ganache filling. But if you left that out, maybe reduce the baking time to 8 minutes and check on them and see if they’re done, and then frost! Look delicious !!! have you tried them with rum instead of jack daniels ???? I have not, but I think it would be delicious as well! I wanted to use this recipe to make a 3ft x 3ft grooms cake. Do you have the recipe or cooking times for larger batches and pans? This is my favorite chocolate cake recipe. The Jack is amazing and not overwhelming at all. I don’t, I’m sorry! But if you give it a shot and find out what works, come back and let me know! Making this recipe for my boyfriends birthday but wanted to make a layered cake or regular.sheet cake…. any idea if the recipe should be changed or the cook Time? Either for 2 round 8 or 9 inxh pan or a 13×9 in pan? I haven’t made this in cake form before, but I’d recommend doing a 9″ round 2 layer cake – I wouldn’t make any changes to the cake mix. You’ll probably need to increase the amount of ganache filling (depending on how much you want in there) and spread it in between the two cake layers. Not sure how well it would turn out or what the baking time would be, but if you do it please let me know how it turns out! What’s the reason for the use of aluminum liners or silicone? Aluminum liners are not easily found where I live. I didn’t want to use silicon because I’m making them for my boyfriend’s birthday dinner and I wanted the liners to match the color scheme. So how far in advance can u make these and refridge them 2 days? Would they still b good? I made these last night and I’m not sure what went wrong. The flavor is awesome but my cupcakes turned out chewy, dense and kinda dry. Maybe over baked? I checked them at 15 mins and they were still liquid in the middle so I gave them five more. I’d like to try them again but not sure what to change. Hello! I just made these cupcakes (actually they are in the oven right now.) the recipe says it makes 24.. I only got 18…. And I didn’t even fill the up 3/4… I was lucky to fill they half way. The batter was super thick and hard to divide evenly… Any idea? I followed the recipe exactly and am an avid (sled taught) cup cake baker. ???? Sorry I was dissapointed by this recipe. The cake rose to a beautiful dome and looked nice but it tasted bland and not moist. The ganache was very good. The frosting was too sweet and gritty. I whipped in a bit of heavy cream thinking it would lighten it up but it turned a bit runny and still tasted gritty. I’m so sorry to hear that! I’m not sure what may have affected your results, but it could always be your elevation, the temperature of your ingredients, how long/what speed the frosting was mixed, etc. I wish I could provide more insight into what may have happened, and hate that you didn’t have a great experience with this recipe since it’s always such a hit for me and so many others. I’m so sorry I didn’t see your comment until today! It’s not necessary to use foil, but it is a lot easier. Your frosting recipe calls for 3/4 stick of butter, which is about 1/3 cup – is that correct? With 3 cups of icing sugar? Made the cupcakes last night, they look & smell awesome! It’s 6 tablespoons. I hope you loved them! Has anyone used the Wilton Shot Tops Flavor Infusers to give this a stronger Jack Daniels taste? I’m making Rumchata Cupcakes and want to make these too for Friendsgiving tomorrow and was wondering how this addition might affect this recipe. Thanks! Would Pepsi work the same as coke? I can’t say for sure since I’ve never done it, but I would think so! I’m happy to be your photographer anytime. 🙂 Have you tried this with Captain Morgans spiced rum? I haven’t, but I know other people have and loved it!